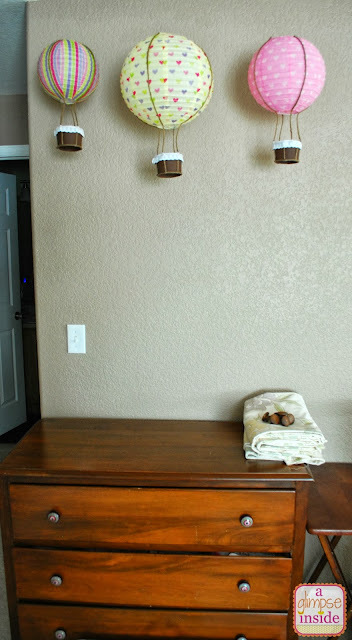 Since the treat buckets I bought were orange, I painted them with a few coats of brown paint. Don't forget to paint the bottom of the buckets too since they will be hanging! Next, take your twine and measure them along the side of the bucket and cut to length. 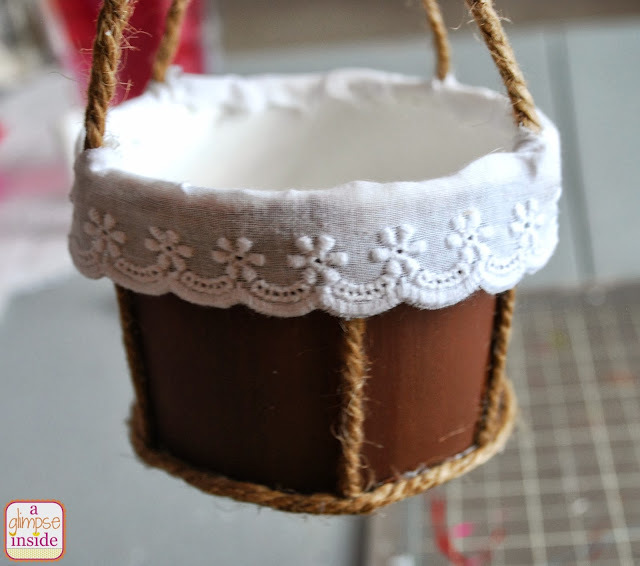 Glue the twine along the side of the buckets like rope. Space the twine evenly around the bucket. 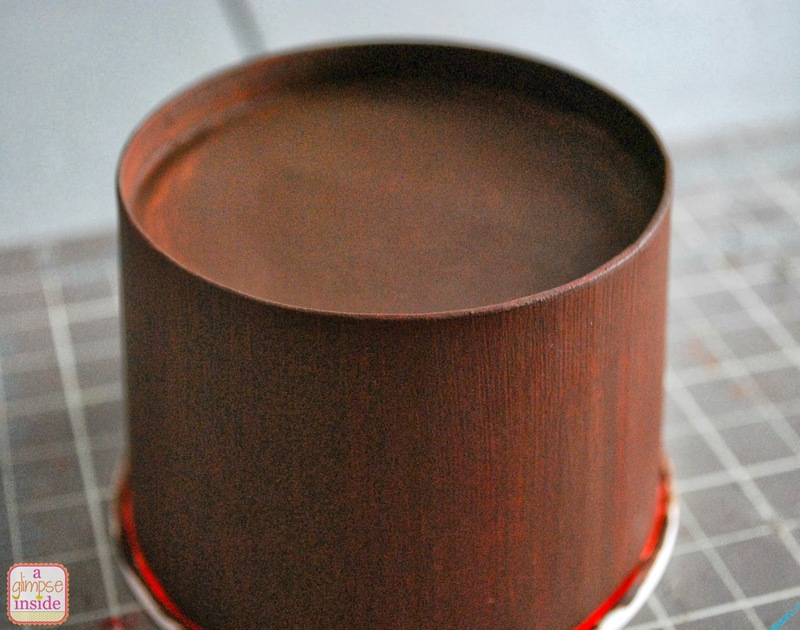 I cut 6 pieces for the size of my buckets. 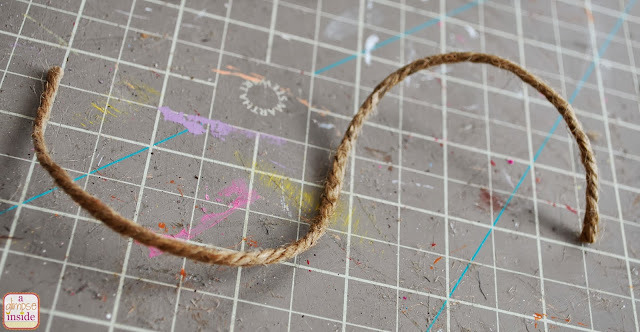 Then, take your twine again and wrap the very bottom edge of the bottom. Cut to lengh. Glue the twine around the bottom edge, overlapping the previous ends of the twine. 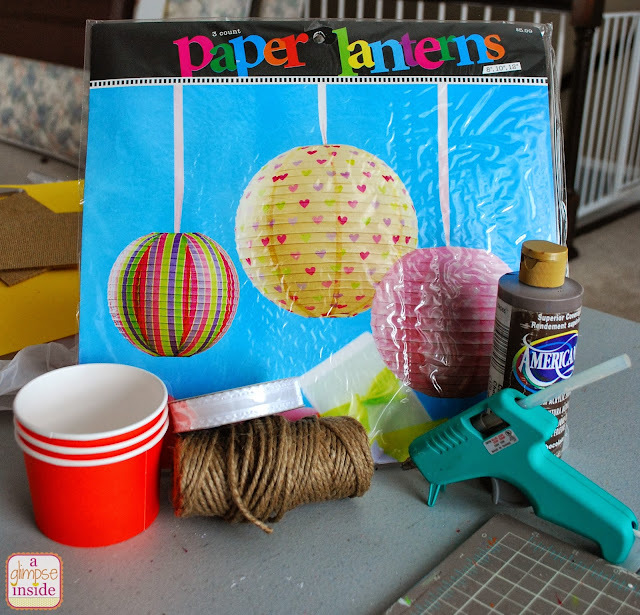 Time to add the twine to the lanterns. 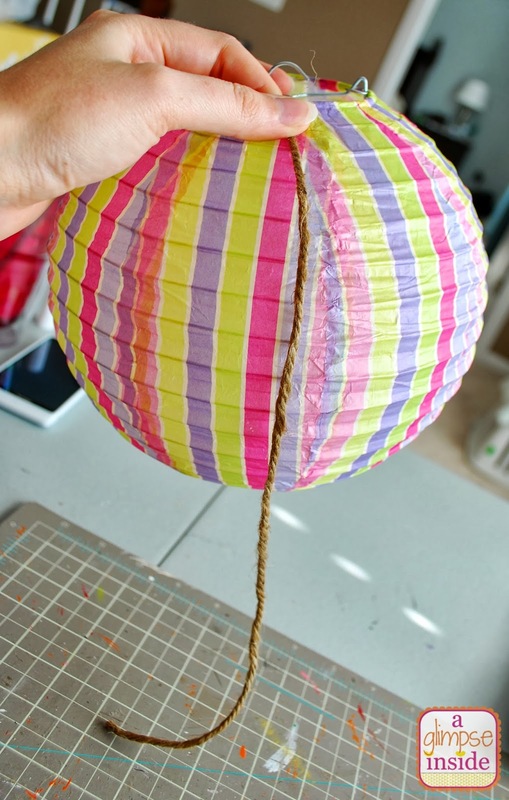 Measure the twine from the very top lip of the lantern, along the lantern to the bottom lip pulling tight. 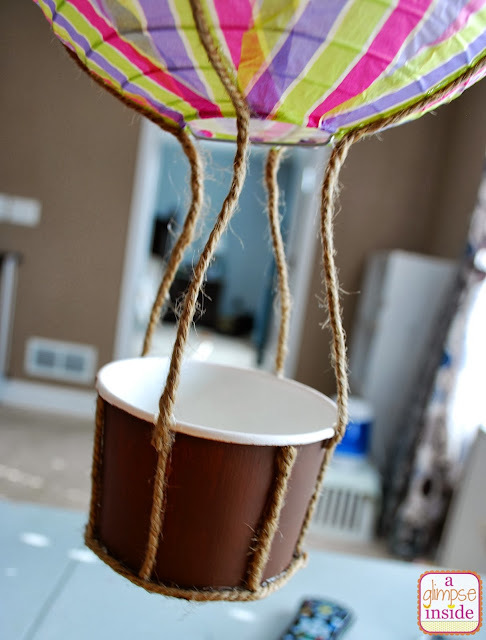 Then extend the twine below the lantern the length you want your bucket to hang. 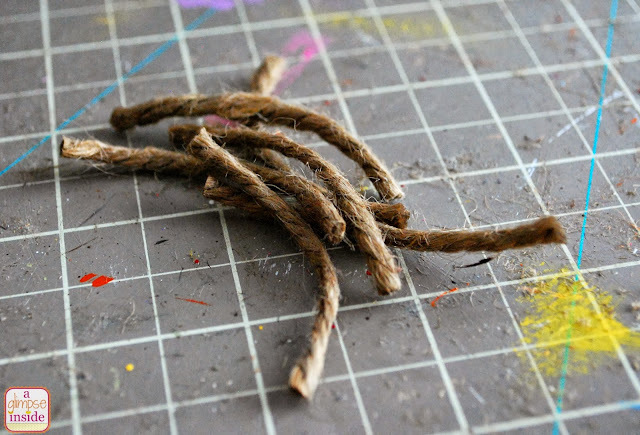 Cut 4 pieces of twine the same length for each lantern. 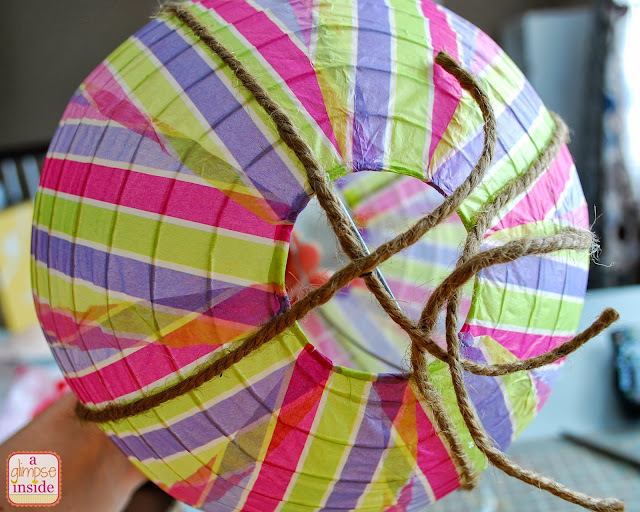 Glue the twine evenly spaced on the lantern. You should have four long ends hanging on the bottom of your lantern. 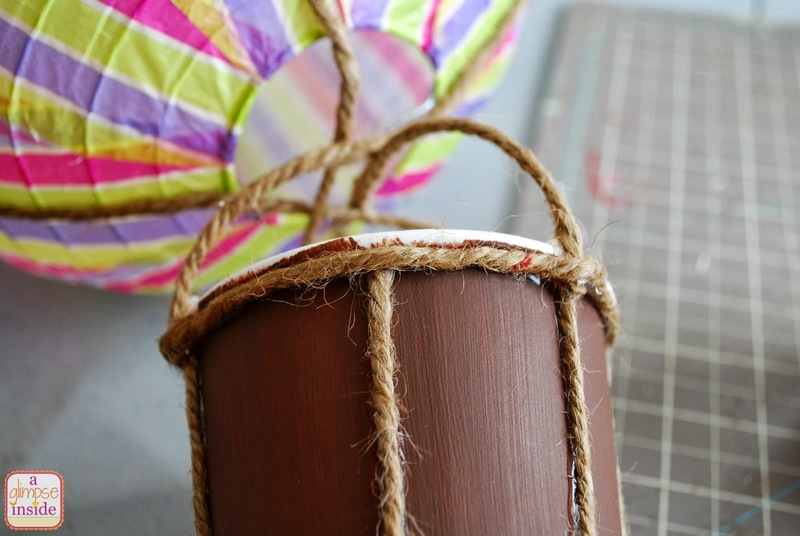 Glue the ends of the twine from the lantern to the bucket. 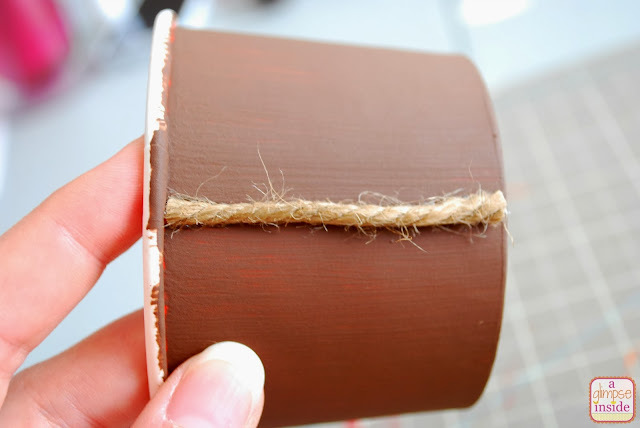 Wrap the top edge of the bucket with twine overlapping all the ends of twine already glued. You can stop here if you like or you can continue on to add a little something more. 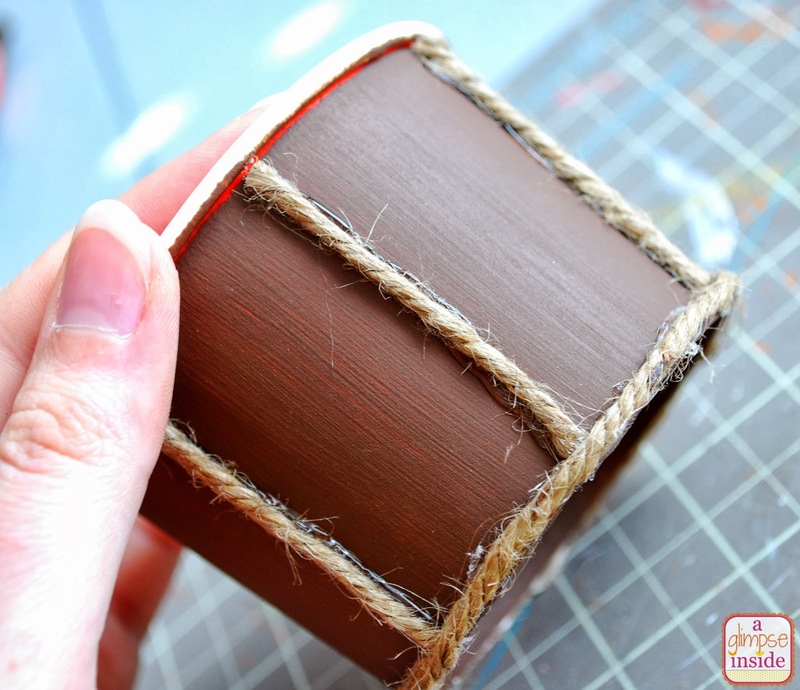 You can use regular ribbon or some eyelet ribbon like I did, your choice! Wrap the top edge of the bucket and cut the ribbon to length. 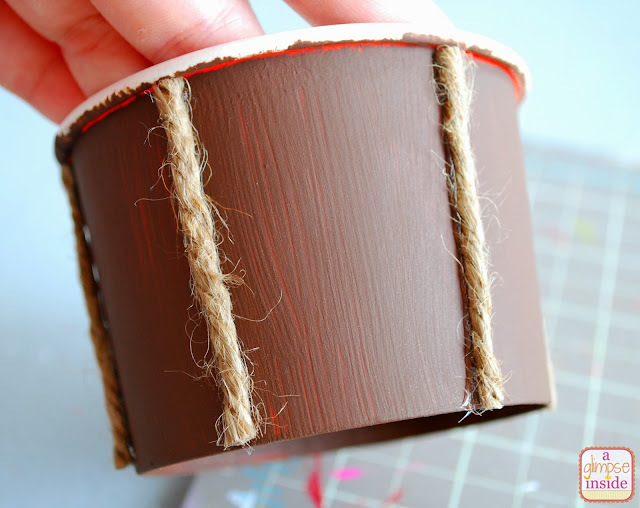 Glue the ribbon to the top edge of the bucket. 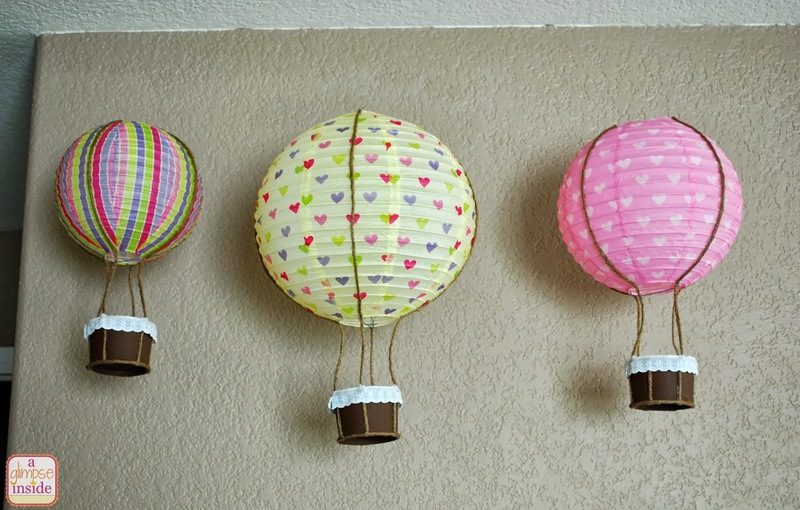 To hang, I tied fishing line to the lanterns and then tied the other end to a push pin and just pushed the pin into the ceiling. 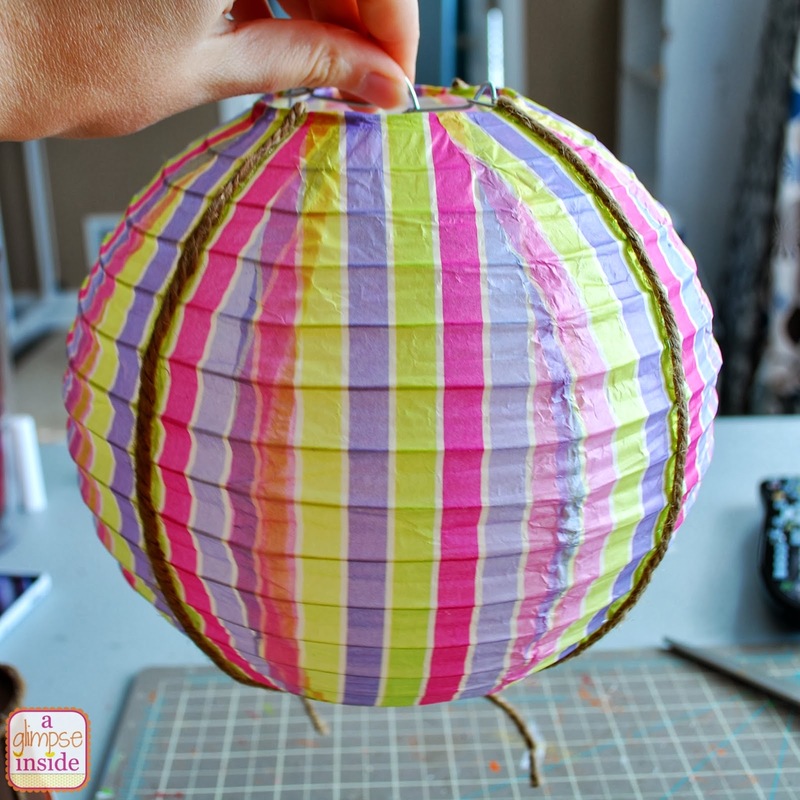 I left my lanterns as is but you can check out a cute way to change them up a little over at Sew. Craft. Create. I love how they came out and can't wait to get the rest of this area completely set up. I plan on adding a banner under the balloons for a little something extra so stay tuned for that in the future! Hope the girls both enjoy this little area as well! Those are so cute! 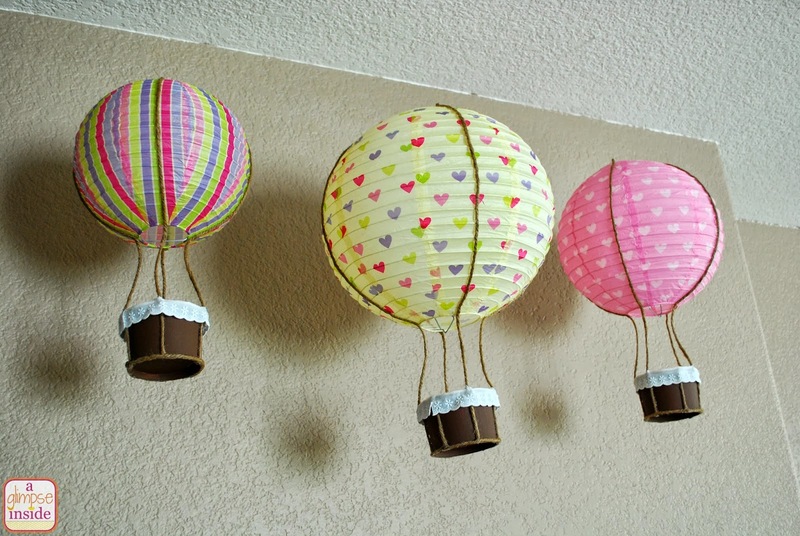 What a fun and simple idea for a girls' room! I love these! So adorable! How adorable! 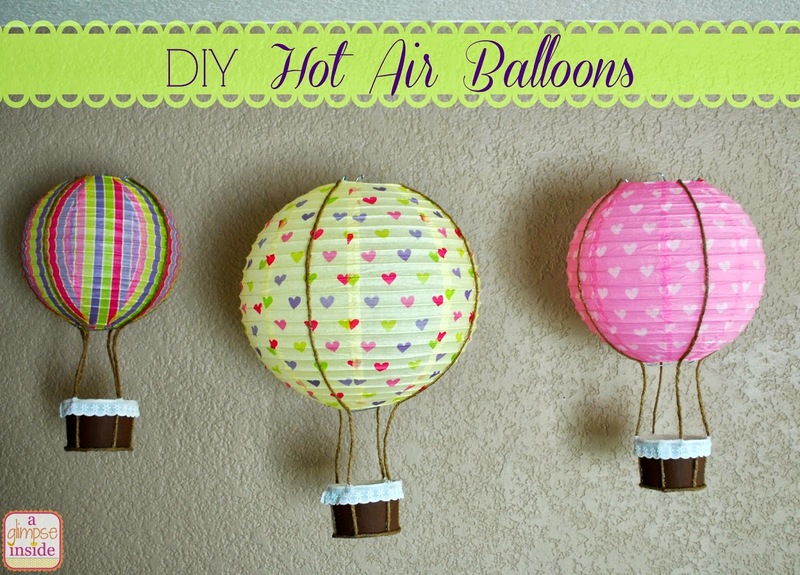 What a fun craft idea, so creative and so cute!!! !